IPCONFIG/RELEASE resulted in "No operation can be performed on Wireless Network Connection while it has it's media disconnected". IPCONFIG/FLUSHDNS resulted in "Successfully flushed the DNS Resolver Cache"
IPCONFIG/RENEW resulted in "No operation can be performed on Wireless Network Connection while it has it's media disconnected". Reboot resulted in no apparent change in Connectivity, Sound/Volume or Firewall engagement. Let's try the obvious...shut down your computer....unplug your router for 30 seconds...plug the router back in...turn on computer....see if your internet is back. Ok, reboot w/router shutdown was not sucessful. It seems the machine can no longer "see" the wireles lan card. I can try to wire connect to the router if you think that might work......??? For the time being go ahead and use a wire and run the ESET scan. When you get finished post the log created. The easiest way to reset services is to use this tool. Select the items Checked in the screen shot below (remove the checks from the rest ) and check Restart System When Finished. Sorry about the delay. 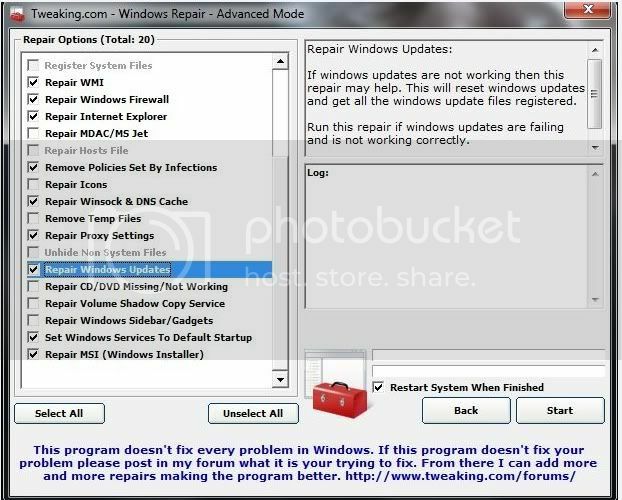 I will install and run Repair AIO as requested. Thanks for sticking w/me!!! Well I am writing this on the machine in question!!!!! YAY!!! Where do we go now? What Anti-virus program should I have engaged? MSSE? or Malwarebytes? Way to go. Glad that worked. What Anti-virus program should I have engaged? MSSE? or Malwarebytes? Well, for now you can not worry about either. Go ahead and try to get an online scan with ESET with the instructions that I had provided. Once you get that scan completed go ahead and start up Microsoft Security Essentials. You can run Malwarebytes at the same time as well because they are not the same thing. MSSE is an antivirus that scans certain areas of the computer while Malwarebytes scans other areas of the computer that an antivirus program will not. In your next reply post the log made by ESET. Save this as CFScript.txt and change the "Save as type" to "All Files" and place it on your desktop. Very Important! Temporarily disable your anti-virus, script blocking and any anti-malware real-time protection before following the steps below. 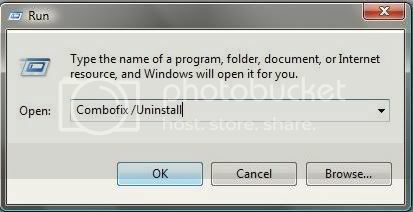 They can interfere with ComboFix or remove some of its embedded files which may cause "unpredictable results". When finished, it shall produce a log for you. Attach the contents of the log in your next reply. Attached is the latest Combofix log..
How is your system running? Quite well in fact. Much faster. Do you see anything else that needs addressing? IT APPEARS THAT YOUR LOGS ARE NOW CLEAN SO LETS DO A COUPLE OF THINGS TO WRAP THIS UP!! This infection appears to have been cleaned, but I can not give you any absolute guarantees. As a precaution, I would go ahead and change all of your passwords as this is especially important after an infection. Click Start > Run and copy/paste the following text into the Run box as shown and click OK.
Any of the logs that you created for use in the forums or remaining tools that have not yet been removed can be deleted using right-click > delete so they aren't cluttering up your desktop. From within Internet Explorer click on the Tools menu and then click on Options. Click once on the Internet icon so it becomes highlighted. Click once on the Custom Level button. When all these settings have been made, click on the OK button. If it prompts you as to whether or not you want to save the settings, press the Yes button. Next press the Apply button and then the OK to exit the Internet Properties page. Restart Internet Explorer and in the bottom right corner of your screen you will see Protected Mode: On showing you it is enabled. 3. Use and update an anti-virus software - I can not overemphasize the need for you to use and update your anti-virus application on a regular basis. With the ever increasing number of new variants of malware arriving on the scene daily, you become very susceptible to an attack without updated protection. 5. Make sure you keep your Windows OS current. Windows XP users can visit Windows update regularly to download and install any critical updates and service packs. Windows Vista/7 users can open the Start menu > All Programs > Windows Update > Check for Updates (in left hand task pane) to update these systems. Without these you are leaving the back door open. 6. WOT (Web of Trust) As "Googling" is such an integral part of internet life, this free browser add on warns you about risky websites that try to scam visitors, deliver malware or send spam. It is especially helpful when browsing or searching in unfamiliar territory. WOT's color-coded icons show you ratings for 21 million websites, helping you avoid the dangerous sites. WOT has an add-on available for Firefox, Internet Explorer as well as Google Chrome. 7. Finally, I strongly recommend that you read TonyKlein's good advice So how did I get infected in the first place? Please reply to this thread once more if you are satisfied so that we can mark the problem as resolved. Jeff, I have done all the clean ups and additions you have recommended. Thanks very much for all your help and expertise. I would never have been able to fix this by myself. I truly appreciate it. Cheers and have a good one!!! If you are the topic starter, and need this topic reopened, please contact a staff member with the address of the thread.